I have been struggling my way back from my missing mojo. Vintage isn't usually my style but it's really growing on me. I thought I would try my hand at a simple vintage card. 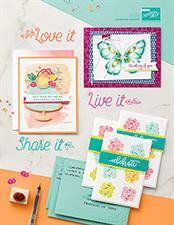 This one uses this beautiful set from the Occasions mini catalogue called Vintage Vogue. The kids are on spring break this week. It's supposed to be in the 70's and sunny. I LOVE this weather! I have lost my mojo. We all go through this at times. I tell my customers that stamping is like a muscle. If you work it often, you'll get good results. If you haven't done it for awhile, it is going to be painful. Well, I am in the painful stage. Even being away from it a week has been tough. I have been caseing other's work but it hasn't been flowing for me. I did come up with this card. The gems are from the no longer available Easter Egg kit from Stampin' Up! The butterfly is from the hugely popular Butterfly Embosslit. It is on backorder for an indeterminite amount of time. I need a card for a party on doing tonight so I cam up with an alternative card. The main piece is done by running some Whisper White cardstock through my Big Shot with the Finial Press embossing folder. Once your cardstock is embossed turn it over to the WRONG side and brayer over it with Rich Razzleberry ink. The ink resists where the "dips" in the embossing are. I hope to "exercise" my stamping muscles more so the mojo keeps flowing. Wish me luck! I saw this beautiful card by Julie last week. I wanted to incorporate some of the ideas of her card for a party I was doing but felt I needed to simplify it. Here is my version. My 12 year old nephew had his birthday party last night. This afternoon we are off to my goddaughter's birthday party. She's turning 3 and I love to shower her with cupcake goodies! I'm trying to mold her into a cupcake lover. It's not too difficult at this young age. They make the cutest little things for little girls! I still need to make her card. I'll post that and her birthday goodies later. We made this card at a party last week. 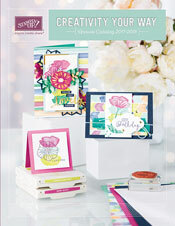 The paper is from the Sale-a-bration paper pack you can earn for free and the bird on the branch are all part of a new punch in the Occasions mini catalog. I hadn't done a joyfold card in a long time so that's what I did. I was just playing with the stamp set, Fox and Friends, and came up with this simple card. I used the new epoxy chocolate chip brads. These are so yummy and at only $3.25 for a package, they're a bargain! Thanks for stopping by! I have three events in the next three days so I gotta get busy!